In this preliminary study, a new approach to ion-exclusion chromatography is proposed to overcome the relatively poor conductivity detection response which occurs in ion-exclusion chromatography when acids are added to the eluent in order to improve peak shape. 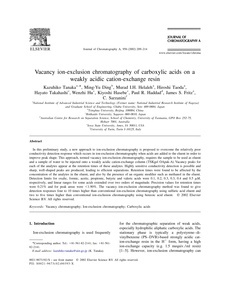 This approach, termed vacancy ion-exclusion chromatography, requires the sample to be used as eluent and a sample of water to be injected onto a weakly acidic cation-exchange column (TSKgel OApak-A). Vacancy peaks for each of the analytes appear at the retention times of these analytes. Highly sensitive conductivity detection is possible and sharp, well-shaped peaks are produced, leading to efficient separations. Retention times were found to be affected by the concentration of the analytes in the eluent, and also by the presence of an organic modifier such as methanol in the eluent. Detection limits for oxalic, formic, acetic, propionic, butyric and valeric acids were 0.1, 0.2, 0.3, 0.3, 0.4 and 0.5 μM, respectively, and linear ranges for some acids extended over two orders of magnitude. Precision values for retention times were 0.21% and for peak areas were <1.90%. The vacancy ion-exclusion chromatography method was found to give detection responses four to 10 times higher than conventional ion-exclusion chromatography using sulfuric acid eluent and two to five times higher than conventional ion-exclusion chromatography using benzoic acid eluent.